Refined and redesigned, the new Veritas micro-adjust wheel marking gauge draws on two decades of manufacturing experience, with subtle improvements across the board. 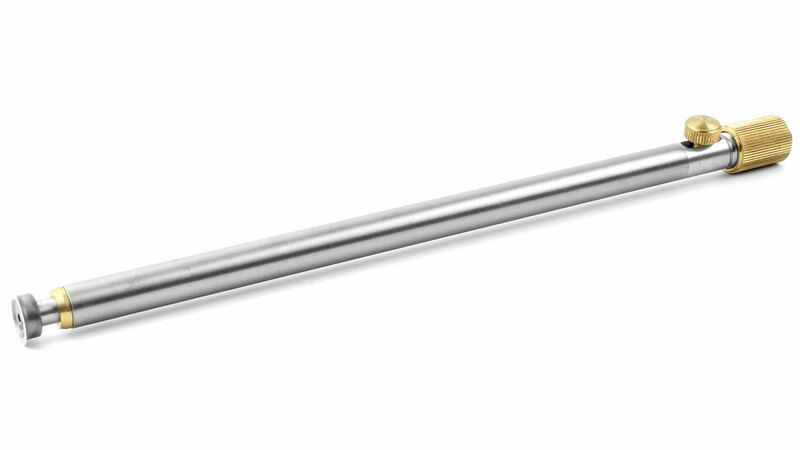 The adjustment mechanism built into the stainless-steel rod is intuitive to use. After setting the approximate projection, you can fine-tune the position of the cutter within a range of 6.35 mm (1/4 inch). 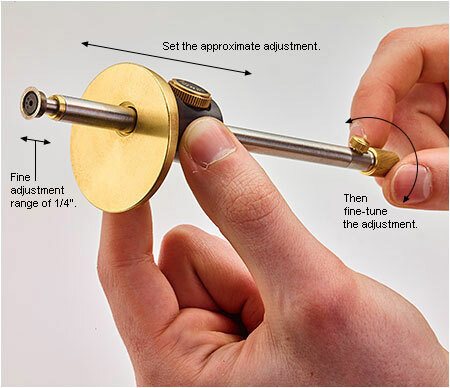 A fine-pitch internal thread allows slow, careful adjustment, so setting the gauge precisely is a snap. Locking knobs keep the setting from shifting in use. The eccentric placement of the rod through the brass face and aluminum body ensures a large reference surface for square registration on the stock and helps the gauge resist rolling on a bench top. 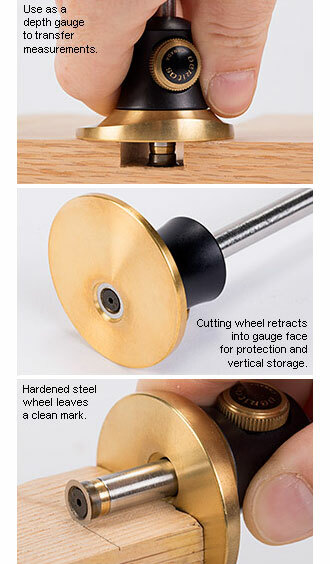 Of course, the core of the marking gauge is still the hardened steel wheel cutter, which solves the two main problems of a pin-based marking gauge – the need to tilt it just right to avoid chatter, and the tendency of the pin to follow the wood grain, throwing off your line. It scribes perfectly at any point of its circumference, cutting neat marks even on cross grain. 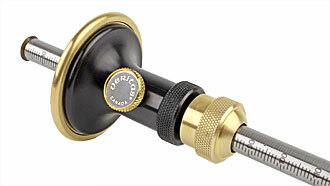 The wheel's single-sided bevel also pulls the gauge face against the stock, helping to maintain accuracy. Its cutting edge is at the extreme end of the rod, useful for transferring dimensions such as tenon shoulder and mortise depth, and retracts into a hollow in the gauge face for protection. Allen key 1/16 inch to mount the marking wheel included! 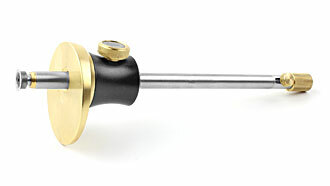 The micro-adjust rod is available separately from the gauge body to let you easily upgrade a Veritas standard wheel marking gauge you own with the new adjustment mechanism. 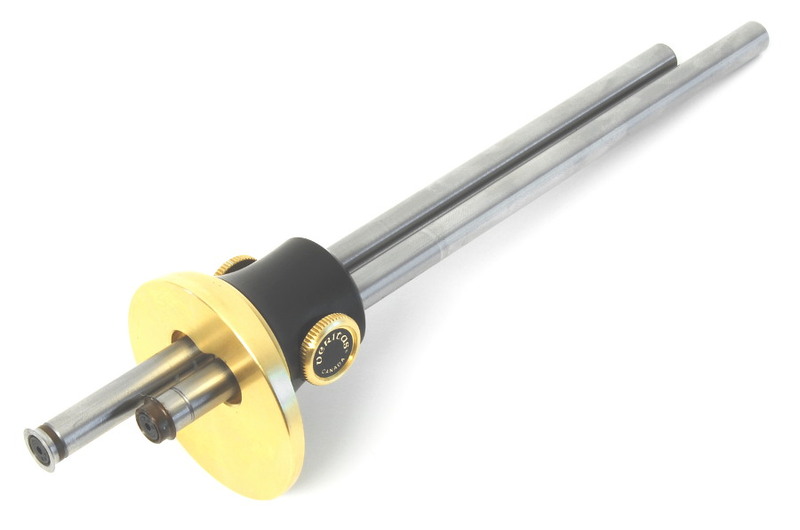 Can replace the rod on any marking gauge body with a 8 mm bore. Allen key 1/16 inch to mount the marking wheel NOT included! VERITAS Marking/Mortise Gauge Heads Though designed for use with the Veritas Wheel Marking Gauge, these gauge heads are a simple retrofit for any marking gauge with a 5/16 inch (7.92 mm) diameter shaft. Note: will not fit 8 mm shafts! Made from carbon steel, the 5/8 inch (16 mm) diameter wheel cutters will scribe at any point in their circumference and slice rather than tear fibers for clean, accurate cuts. 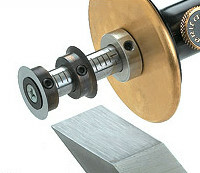 The single-bevel cutters are usable in-line for marking parallel lines, or with bevels facing for sure mortise sizing and chisel registration. Secured with integral set screws, the blades can be set as close as 3/8 inch (9.5 mm) apart. The included shaft collar registers against the marking gauge fence to ensure the shaft remains parallel to the workpiece, preventing accidental tilting of the cutters in use; this is especially useful when scribing large offsets from the fence. Supplied as a pair of cutters with a shaft collar, hex key and instructions. Made in Canada. Projection up to 5-3/4 inch (146 mm) is easy to set, since an internal O-ring keeps light but constant friction on each rod; a thumbscrew locks the setting. 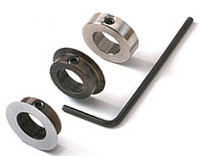 The hardened steel wheel cutters scribe perfectly at any point of their circumference. Since they cut wood fibers rather than tear, marks are clean, even on cross grain. The cutting wheels are oriented with opposing bevels, ensuring that you can always set the bevel in the waste side of a cut. One rod has its cutting edge at the extreme end of the rod, making it useful for transferring dimensions such as tenon shoulder and mortise depth. 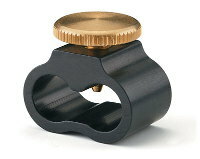 Each cutter can be retracted into the brass face for safe storage or to permit use with a single cutter. 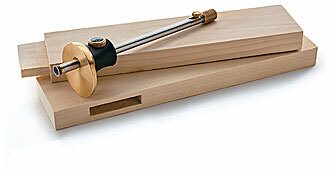 The eccentric placement of the rods ensures a large reference face and helps the gauge resist rolling on a surface. Aluminum housing with brass face and stainless-steel rods. Length 7-1/4 inch (184 mm) overall. 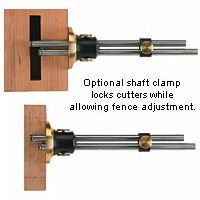 VERITAS Shaft Clamp Designed to fit onto the dual marking gauge's guide rods, the optional shaft clamp lets you lock the relative position of the cutters while still being able to freely adjust the fence for offset. This allows you to preserve identical mortise or tenon sizing when joining parts of different thicknesses or when adding a reveal, since it prevents the cutter settings from shifting while the fence is being repositioned. 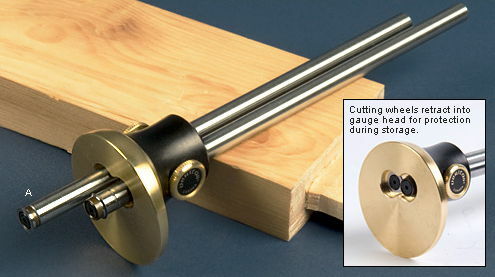 Machined to precise tolerances to prevent binding on the rods, the 1/2 inch (12.7 mm) long collar is made from extruded aluminum, with a turned brass thumbscrew that tightens onto the marking gauge's steel guide rods without marring their surfaces.